Laidback Todos Santos on Mexico's southern Baja California coast. Sign up for the FREE Roving Real Estate Investor e-letter and get a valuable report (free for a limited time) on an urgent Caribbean opportunity: Real Estate Profits in the Riviera Maya. With more than 350 days of sunshine a year the southern Baja California in Mexico is a favorite destination of vacationers and expats alike. Most head to the very tip, to Los Cabos—as the area in and around the towns of Cabo San Lucas and San Jose del Cabo is called. But head north about 45 minutes on a well-maintained highway through the desert landscape of rolling scrub-covered hills and craggy cliffs dotted with saguaro cactus as far as the eye can see, and you come upon a world away from the high-rise condos, shopping malls, golf courses, and resorts. It’s the small town of Todos Santos, which has a heritage going back to 1723, when Jesuit priests set up a mission there. This Pueblo Magico (an official designation from the Mexican government to recognize its unique cultural significance) has a slow-paced, sun-baked feel, with a town center full of historic, restored buildings that have been turned into boutique hotels, restaurants (both traditional Mexican and gourmet restaurants, street-side stalls, and international cuisines are represented), and hip cafés. There’s even a microbrewery producing quality craft beer. 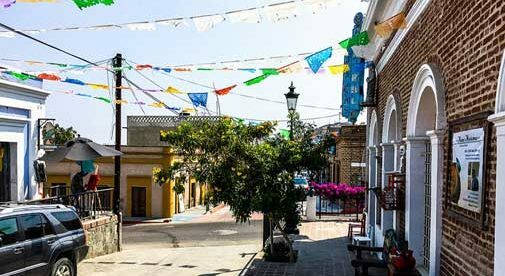 Todos Santos, population 7,000, is famed for its art scene, with many galleries, and workshops for both fine artists and traditional artisans creating folkloric crafts, jewelry makers, and home décor designers. This area has also become a hotspot for organic farming. You can buy direct from the growers; weekly home delivery of organic produce is also available. And fishermen still head here each day; seafood at the markets and in restaurants is excellent here. Expats seeking to get away from the hustle and bustle of Los Cabos flock to Todos Santos, which also offers great surfing at nearby Cerritos Beach (if you just want to relax in the shade with a cold drink, that’s fine too). Yet, you have the top-class medical care, shopping, entertainment, and other services just down the road about 45 minutes to an hour away. The best of both worlds. There’s also a busy international airport in San Jose del Cabo, another 30 minutes across the peninsula. Many expats actually drive back and forth for visits to the U.S. It’s about 20 hours to San Diego. The landscape isn’t for everybody. This is the desert. The views are stark: Rocky cliffs against the light blue sky and deep blue Pacific, which often has swimmer-unfriendly booming surf. If you like dry weather…the dry heat without humidity, it could be an ideal spot. Although locals maintain Todos Santos stays 10 to 15 F cooler than Los Cabos at the tip of the peninsula. The growing popularity of this town—and the limited housing stock—has pushed prices up in recent years. Many people also buy lots (starting at $30,000) and then build their dream. But there are still deals to be had on ready-to-move-in homes. A one-bedroom home, set on a quarter acre of land, is listed at $139,000. A three-bedroom house two blocks from the beach, with pool, large garage, and partial ocean view from the second-floor terrace comes furnished at $255,000. Set back from the beach, and a five-minute drive from Todos Santos, is a three-bedroom home on one-third of an acre for $248,500. About a five-minute walk from the water, in a private community, is a two-bedroom luxury home, large covered thatch terrace, and extensive landscaping (including fruit trees). It’s available for $307,000. In town are two side-by-side, one-bedroom casitas sold together. You could live in one…rent out the other. There are ocean views from the rooftop terraces. List price is $199,000. Sign up for the FREE Roving Real Estate Investor e-letter and get a valuable report (free for a limited time) on The Exact Location of Where to Make the Most Real Estate Profits This Year (Plus 4 More Places to Build Your Fortune in Latin America and Europe).